Recently, we had a surprise visit at the fire station from a group of very nice young ladies. These young ladies are with Brownie Troop #71165 in Lititz and they brought us a TON of cookies. According to Scout Leader Miss Cathy, "The cookies we brought you are purchased by customers from our community and by Girl Scout families. At each of our cookie sales we choose a worthy organization we want to support and ask for donations of cookies to give to that group. 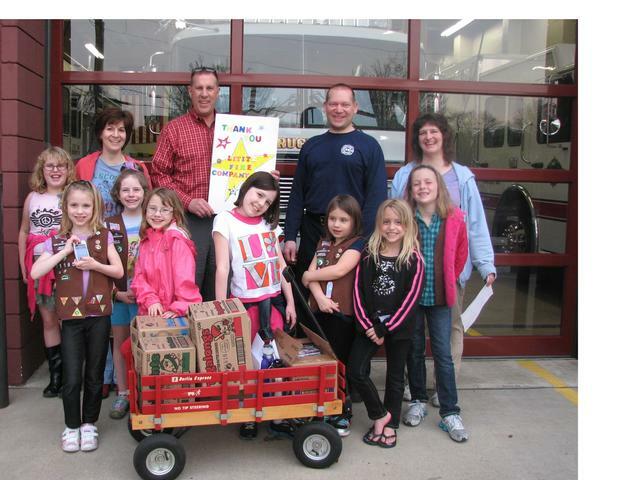 This year we wanted to collect cookie donations for the Lititz Fire Company to thank you for all you do." We are very grateful to the girls, the leaders and everyone who purchased cookies to donate to our members. Your act of kindness is very much appreciated!! In the picture are: Leaders: Miss Cathy & Miss Debbie; Brownies: Sydney, Alexis, Renee, Lauren, Skylar, Isabelle, Alyssa, Grace & Kylie (not present).